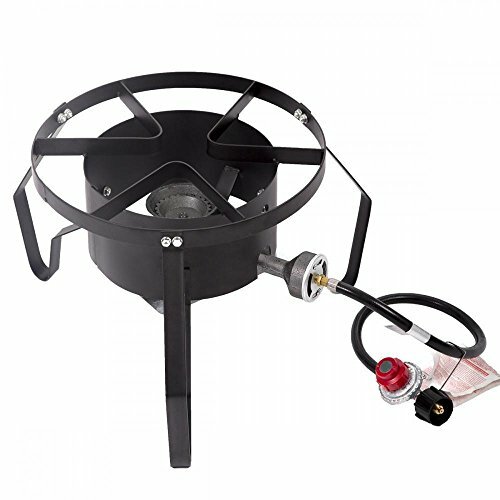 The Propane Patio Stove is a revolution in outdoor cooking. These units far surpass the same tired backyard grill. They offer the widest range of cooking options, operating from a bare simmer to a blast flame! Strong enough to accommodate any size stockpot, fryer/steamer, cast iron cookware, or griddle. The square frame design allows for large stockpots, and this innovation greatly increases the strength. 14" diameter cooking surface, 13" tall welded steel frame, 4" cast iron burner, 5-PSI adjustable hose and regulator, 360° degree windscreen protection, 8"*8" galvanized heat plate, Designed to hold up to a 120-qt stockpot, 54,000 BTUs heat output.